Best Mother's Day Gift Idea Ever! 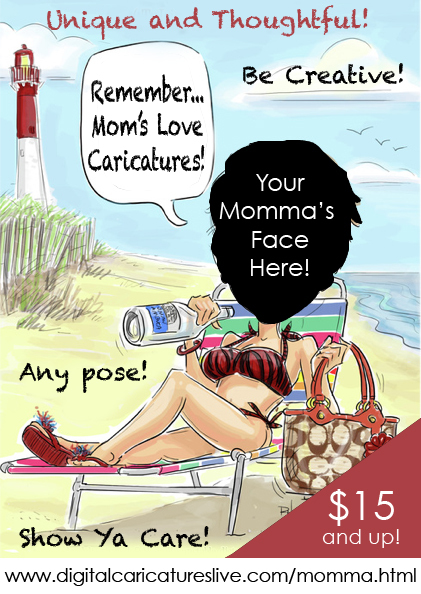 Make Mom feel extra special this year or get her back for all those Caricatures she made you get as a kid! Choose from B/W or Color and Head Only or Full Body Shot! • We can integrate your idea into a custom sketch! • This is your chance to make up for all those years of lame flower arrangements and give her something that will make her look and feel great for a very long time! * For Ideas- Look at our . "Studio Drawings from Photos" page to see how we creatively make each one special! 1- Pay for Caricature below. 2- Fill out the Form below and submit with it your picture of Mom! to have it printed by us, framed and shipped. Step 1: Purchase, It will redirect you back here after! Tell us what you want specifically here... More details the better! This is only if you decided to purchase the print and frame and paid for it above. Tell us if its Mom's Address or Yours So we can address it accordingly.